If there’s one thing I always love during the Winter months, it’s to indulge my skin with some moisturisation and give my hair some TLC after facing the elements of the UK weather. I’ve gone through countless body butters and lotions over the years to try and revive my skin, and even cut my hair short again recently to get rid of the damage! When I heard about the All Boxed Up ‘Home Spa’ edition, £113 worth of luxury beauty products for just £19.99, my interest was piqued. I’ve tried a few beauty boxes over the years that have quite honestly not lived up to expectations, but this one, promising 100% authentic full size products, has to be the best I have seen! 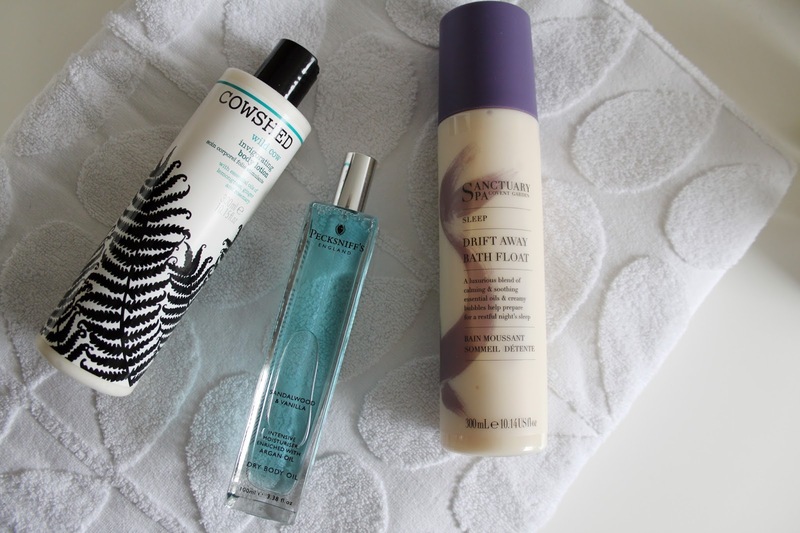 I’ve spent the last couple of weeks testing out these products to see if they love up to their luxury claims, and can honestly say that I am so impressed. I’ve been using the Sanctuary Bath Float in every bath, whether by itself or paired with a Lush Bath Bomb. It adds a lovely thick layer of bubbles to the bath and makes my skin feel silky and delicately scented afterwards. Obviously when paired with a bath bomb it’s qualities are somewhat overshadowed, but when using alone it definitely tops all the bath products I’ve used in the past. After a bath or shower, I’ve been using the Pecksniff’s Dry Body Oil over my arms, chest and stomach. A few spritzes does the job, and after a quick massage in to the skin, it’s left soft and silky with a lovely vanilla scent and zero greasy residue. 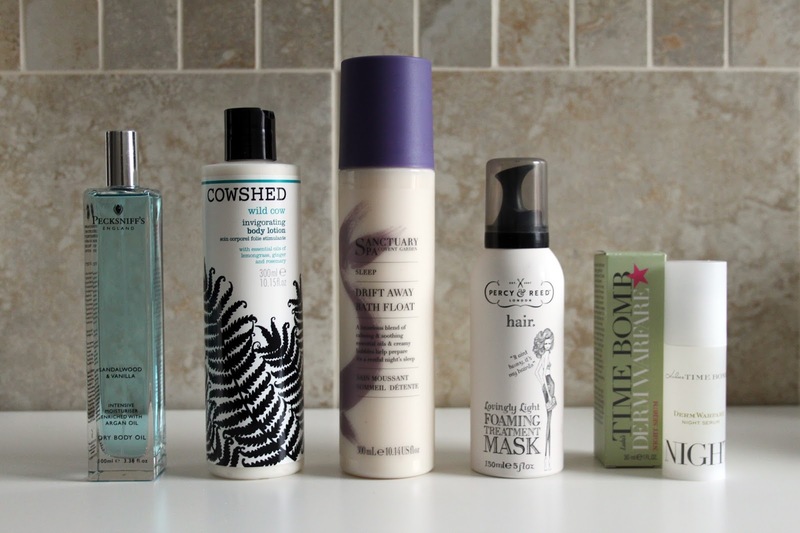 I then use the Cowshed Body Lotion on my legs which tend to be dry. It’s such a dreamy thick lotion that blends in beautifully without being sticky, and the scent is amazing. Notes of lemongrass, rosemary and ginger make this feel super luxurious and completely different to the sweet scents in my collection. I will definitely be repurchasing this one when I run out. 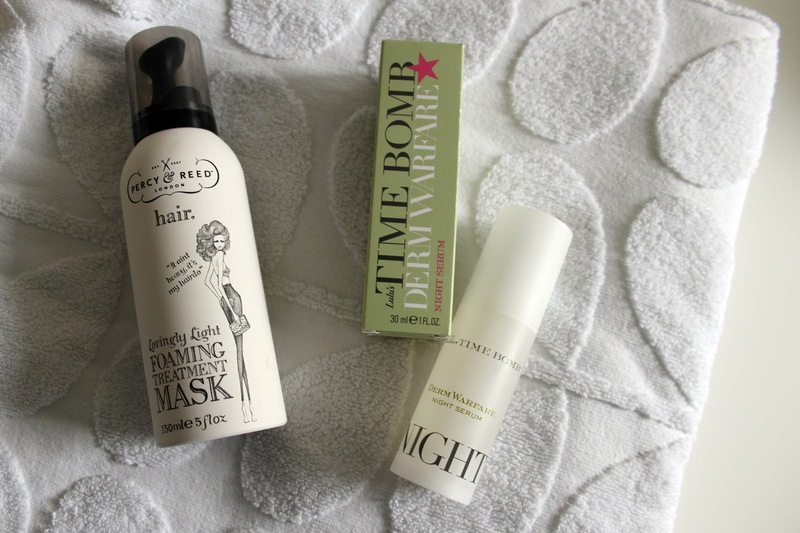 My favourite product from the box has to be the Percy & Reed Foaming Treatment Mask. I’ve been using this after shampooing once a week and absolutely love it. This foams up like a mousse that you comb through wet hair, and leave it for 5 minutes whilst it works it’s magic. After rinsing, drying and styling, my hair feels silky and in such good condition. Since using this my hair has felt so much better than usual and I’ve had so many compliments on how shiny and healthy it looks! The final product in the collection, and admittedly one that I haven’t got round to testing out as much as the others, it the Time Bomb Night Serum. The couple of times I have used it, I’ve noticed my skin feels bouncier and softer the following morning, but I will hold my hands up and say I’m a lazy girl when it comes to skincare, so my night time routine often consists of a few make up wipes ad nothing else (bad I know!). I’m going to keep at it with this though and see if I can fit it in to my routine as often as possible as it’s such a nice product and I have noticed results already. I will keep you all posted! All in all, I’m so impressed with this box from All Boxed Up. There’s a great selection of other boxes on their website, but hurry as they are only around for a limited time! I’ve got my eye on the Valentine’s box (hint hint Dan if you’re reading) as there’s some incredible products in there. Have you tried out any of the All Boxed Up boxes? What other beauty boxes would you recommend? "FANCY FITNESS WITH BOOHOO FIT"